I don't know about you, but I am getting sick of worthy causes. I'm burned out on saving the whales, running for the cure, and buying Girl Scout cookies, but I still have the urge to do good so I have found the perfect cause. I'm working hard from here on in to save the words. I love words. I love to read them, write them and roll them around on my tongue. I especially love English words as English is not only my native language, but also the lingua franca of the world. 93 countries across the globe consider it an official language. So saving English words from extinction will be my next great calling and I intend to be a royal pain where I never had a toothache about it. Not until I came across a marvelous organization called Save the Words did I know of the terrible plight of my mother tongue. English is the most spoken language in the entire world, and contains the richest vocabulary. It has an estimated half million words. Its nearest rival, German, has less that 200,000. But in spite of its rich vocabulary, the English language is in deep trouble. It seems that every year hundreds, perhaps thousands of words simply disappear through lack of use. Tragic isn't it? We can all do something about this sad situation by adopting a word and promising to use it daily in both writing and conversation. 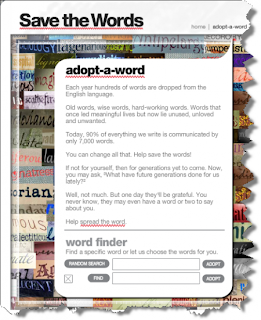 There are hundreds to choose from at the Save the Words website and they are so cute--It's like picking a puppy. Go have a look. I had a hard time making up my mind. Mingent looked adorable and sounded so sweet, I thought I would take it-- but hold on..... it turns out mingent means " discharging urine" as in:"that drunk is a mingent man." Not too many opportunities in my quiet,well regulated world to rescue mingent from obscurity so I settled on oporopolist, a noun which means fruit seller. I should be able to work that into the conversation, at least in the grocery store. Hmmm maybe I'll get a tee shirt that says " take an oporopolist to lunch today" It'll make a nice change from save the whales and I'll be doing my bit to save the English language. Note: as of last night, the savethewords.org seems to be down-- maybe they had too many adoptions pending:-) hoping they fix it soon. Not only are we losing words, the additions are usually moronic. Example: frenemy. Yep...it's in the Merriam Webster dictionary. And...it looks like phrases are now being counted as words!